Two years ago today, I created my first post on The Sweets Life. My, my how times have changed! I reflected on some of those changes in my one-year blogiversary post and can continue to echo those same sentiments. My confidence, enjoyment of, and creativity in the kitchen have all increased. I have more people finding my website on a daily basis. I started a recipe index, as I mentioned wanting to do last year. I also unveiled a new blog design and created a Facebook page. It's been a good year for The Sweets Life, and I suspect this next one will be full of more good eats. Thank YOU to all of my readers, for joining me on this journey. Thanks to those of you who faithfully read on a daily basis, to those of you that subscribe to The Sweets Life in Google Reader, to those of you that leave comments on my blog or Facebook page when you try a recipe, to those of you that share your favorite recipes with me, and to those of you who willingly taste test whatever crazy recipe I throw at you! I appreciate each and every one of you! Blogging is a fun outlet for me, but it is all the more rewarding when I get the chance to interact with readers, whether its helping you plan your dinner parties, envying food on your blogs, or just making good food to share with you via The Sweets Life! 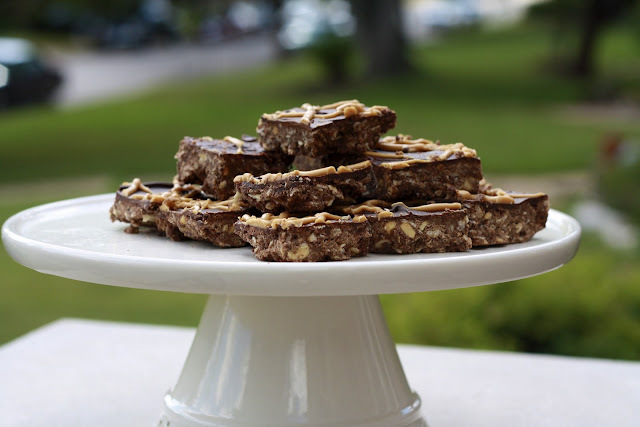 It is so very appropriate that I share this Martha Stewart recipe for No-Bake Chocolate and Peanut Butter Oatmeal Bars. Not because I've become a Martha Stewart-like extraordinaire in the past two years, quite the opposite actually! 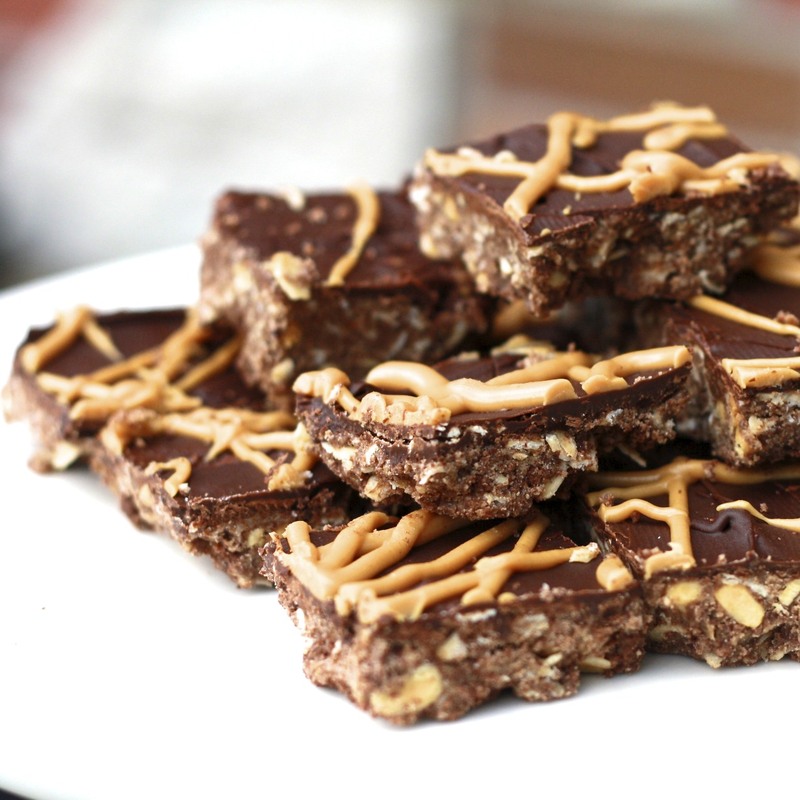 When making these bars, I learned that you cannot melt peanut butter in the microwave. I was also reminded that I am still incapable of melting chocolate without burning it....which is why my bars are topped with simply a peanut butter drizzle instead of a peanut butter AND milk chocolate drizzle. So yes, this is an appropriate recipe to share today...because no matter how many recipes I post, how many readers I gain, and how much time I spend in the kitchen, I will still be humbled, still be learning, and still be sharing those stories with all of you! **Read below the recipe for another fun take on my two years of blogging! 1. Line a 9 x 13-inch baking dish with foil so that there is a slight overhang and spray with cooking spray. Set aside. 2. In a large bowl, combine wafers, oats, sugar, and salt. Melt butter in a medium saucepan over medium heat, then add chunky peanut butter and 3/4 cup smooth peanut butter, whisking until well combined. Add peanut butter mixture to wafer mixture and stir to combine. 3. Pour mixture into prepared baking dish and use a spatula to firmly press into an even layer. Refrigerate for 30 minutes. 4. Melt semisweet chocolate in the microwave or over a stovetop and pour over chilled bars, using a knife or spatula to evenly smooth across the bars. Refrigerate until hardened, at least 15 minutes. 5. Heat 3 tbsp peanut butter in a small saucepan over low heat until runny. Drizzle over the chilled chocolate layer. Melt milk chocolate and drizzle atop the peanut butter. Return to the fridge for 15 more minutes. 6. Using the foil overhang, remove bars from the pan. Cut into squares before serving. *Bars can be refrigerated up to 1 week or frozen up to 1 month. When it comes to savory foods, I think these Grilled Pork Chops with Nectarine Salsa were pretty visually appealing...and they had the flavor to match the look! But of course, I also have to include a dessert in here and that has to be a tie between Reese's Peanut Butter Cheesecake Bars and my favorite Raspberry Amaretto Trifle! Thanks to some serious attention on StumbleUpon, my Cinnamon Rolls are actually the recipe with the post hits over the past two years. I was surprised to realize this, but I guess I shouldn't be...these are pretty dang amazing! Although this post wasn't controversial in the blog world, my Latin Nacho Bowls caused quite a bit of controversy between Ryan and me. Check out the post for the story! I don't really do many 'how to' posts on here, but I did take several pictures when I made the Whole Grain Challah with Cranberries, which I suppose could be helpful if you're a bread-baking newbie, like I was when I made it! Although Taco Pasta Salad isn't necessarily anything fancy or special, I've had several people make this and email me or tell me how much they loved it! Along the same lines, I've received positive feedback from a lot of people who have made Buffalo Chicken Chili. The photo isn't great (note to self: update!) but the Panzanella Caprese salad is one I've returned to again and again. It's the perfect summer salad! However, I have a lot more readers now than when it was originally posted and it definitely deserves a shoutout! This is tough, because to be honest, I'm just pretty proud of this blog in general. I don't mean to come off as conceited, because as I explained above, I'm still incredibly humbled in my kitchen and when I see so many other food blogs that are on a completely different level than mine. That being said, I never would have anticipated being where I am now and with the sheer insanity that is my life right now, I'm proud that I'm still able to devote as much time to making new recipes, photographing them, and drafting blog posts! But, to be fair, I'll answer the question and choose a post at random...the Curried Sweet Potato Chickpea Burgers are special because this was a completely original recipe that not only ended up being successful for me, but enjoyed by others who also tried it! And there you have it...7 (and a few more, oops!) links!